I’ve just received a copy of 1966: the 50th anniversary, which the Football Association have endorsed as the official book of the 50th anniversary of England’s only World Cup victory. This is a cracking book, beautifully illustrated and very well put together, with a quirky blend of familiar narrative of the events of that summer along with a stunning range of photographs. Action pictures from the matches are reproduced alongside pictures of all sorts of World Cup ephemera, ranging from beer mats to knitting patterns, and from ticket stubs to teacups. This book, with a foreword by hat-trick hero Geoff Hurst, serves well as a retrospective of the tournament and the (now) 50 years of hurt that this summer’s Euros in France have done nothing to end. 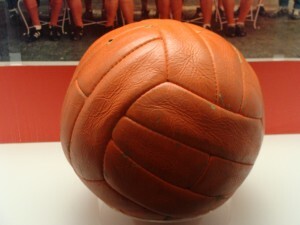 exhibition itself brings together the Jules Rimet Trophy, players’ shirts, equipment, and ephemera along with ordinary people’s stories of the tournament – and, of course, the 1966 final ball posed tantalisingly over a goal-line. The wonderful folk at the Sporting Memories Network have also got involved, and you can share your memories with them as part of their ground-breaking work to help people experiencing dementia and depression. The new update of the Oxford Dictionary of National Biography is now available online – you can subscribe through public and university library systems. This year’s update covers significant Britons who died in 2012, ranging from historian Eric Hobsbawm to novelist Miss Read via actor Herbert Lom, Monkee Davey Jones, and photojournalst Eve Arnold. I’ve written the piece on Liz Ferris (1940-2012), the diver who got the bronze medal in the 3m springboard event at the 1960 Olympic Games in Rome, and who then went on to play a leading role in debates about gender equality at the Olympic Games. Sorry for my silence over the last few months. It’s been a hectic time in which I’ve started my new job as Professor of History and Director of the International Centre for Sports History and Culture (ICSHC) at De Montfort University. It’s great to be at the heart of the sports history scene, and to be working closely with my colleagues in the Centre and the in wider History department. It’s also exciting to be in at the start of the new BA in Sports History and Culture, a unique undergraduate course, and to be working with the wonderful international students who make up the MA in Management, Law and Humanities of Sport. I’ll get back to some proper blogging soon, but for now I just wanted to publicise a research opportunity that is available through the Arts and Humanities Research Council (AHRC), and which is perfect for high quality candidates wanting to undertake a PhD in sport and leisure history with us at the ICSHC. It’s called the Midlands3Cities (M3C) Doctoral Training Partnership, and it brings together six universities – Birmingham, Birmingham City, De Montfort, Leicester, Nottingham, and Nottingham Trent – in schemes of collaborative supervision. 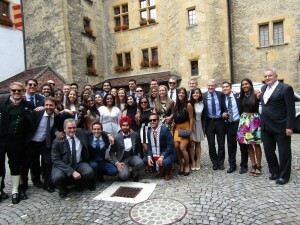 There are various kinds of funding available for UK and EU students. If you are interested in finding out more, or if you are a lecturer and think that some of your students might be up for this, then please email me on martin.polley@dmu.ac.uk for an informal chat. The M3C website is here. In a new initiative, I am publishing a guest blog for the first time. This one, by tennis enthusiast and freelance writer Jonny Rowntree, explores some aspects of Wimbledon’s historical relationship with advertising. If you would like to consider writing a guest blog on an aspect of sports history for this site, please contact me using the details on the Contact page. Since the first Wimbledon tournament in 1877, tennis’ most prestigious event has become the grand stage of dramatic flourishes, redemption and reclamation. Even for non-tennis enthusiasts, Wimbledon has become a tradition that illuminates television sets in pubs and living rooms across the world, its logo as synonymous with the sport as the legends that have graced its turf. Larger than life personalities, wide media coverage, and a successful branding have forged the venue’s legacy. In this article, we take a behind the scenes look into the oldest tennis tournament in the world and how it has cultivated and maintains the traditional image established in the early days of the game, and how Wimbledon is evolving and adapting to new technologies and developments in marketing and advertising. Times have changed considerably from the first black and white print poster in 1894 highlighting the “Lawn Tennis Championships”. This initial break into the event is an excellent lesson in typography and there is a great sense of drama and anticipation, truly announcing itself in turn of the century style. 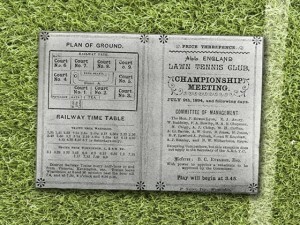 The All-England Lawn Tennis and Croquet Club (AELTCC), the organisers of the Wimbledon tennis tournament, would print its first programme in the same year, outlining the court layout and a train schedule, all for threepence. While these designs would change considerably, the Club wanted to maintain the spirit of its initial presence as a traditional private court, which kept clothing to white and advertising to a minimum. In 1928, London Transport employed artist Frederick Herry Perry to design a series of posters to promote services to Southfields tube station. This saw a considerable move towards livelier colours than in the earlier materials, creating a minimalist narrative with echoes of Art Deco. The 1931 poster was displayed in Underground stations, ticket offices and train carriages. 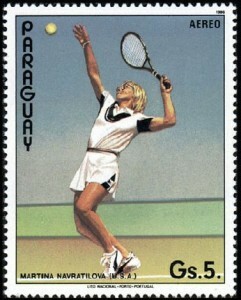 Perry’s innovative design and inclusive graphics helped to open up Wimbledon to the greater public in terms of interest. 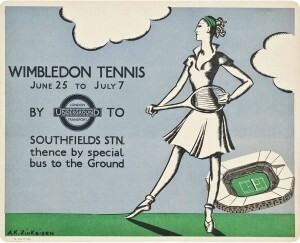 The masterminds behind the marketing understood this all too well as they continued to target specific stations like Wimbledon itself and Southfields, which is closer to the grounds and was emphasized in the 1931 poster. Perry’s connection with the Underground Group and London Transport enabled him to continue his impressive career with Wimbledon until 1937, the year the event was broadcast for the first time on television. Wimbledon’s publicity was increased considerably in the 1980s by the work of Tennis Week’s John Davies, illustrator for both posters and magazine covers. These combined a colourful, pastoral style reflecting vintage eras of the traditional English pastime. Davies’ work is a reflection of Wimbledon’s eagerness to present the event as a distinctly English occasion. As television and radio coverage expanded over the years, the question of further sponsorship opportunities arose. Wimbledon increased in popularity, with 300,000 attending the championship throughout the 1970s, 400,000 towards the late 1980s and the 2010 tournament attracting 500,000 people, according to ESPN. In this context, and with an eye on Wimbledon’s prestigious brand, the organisers resolved to keep sponsorship to a minimum, with only minimal advertising from brands that would appeal to the ABC1 demographic that the event famously attracts. Rather than bring in perimeter advertising or tournament sponsorship, as other sports were doing at this time, Wimbledon restricted advertising to elite makers’ names on essential equipment. 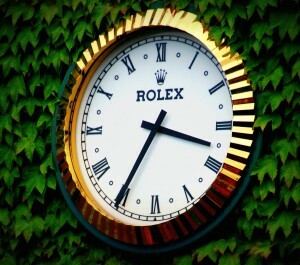 Rolex, the official timekeeper from 1978, thus appeared on scoreboards and courtside clocks, IBM’s logo appeared on the service speed board, while other names have been like Slazenger (which has been there since 1902) and Ralph Lauren, which arrived in 2006. Eager to keep afloat in modern times, Wimbledon went online in 1995. The official website has grown considerably, from 3.2 million to 19.6 million visitors when comparing 2001 to 2013. Additionally, with the growth of smartphone ownership in the late 2000s, Wimbledon commissioned IBM to create a bespoke app which has been downloaded by over 1.7 million users. Wimbledon’s commitment to solidifying its brand and not selling out to sponsors has paid off – 2010 alone saw a surplus of £31 million. Wimbledon referee Alan Mills stated that if the AELTCC decked out the tournament in a fashion like the US Open, then ‘It wouldn’t be Wimbledon, would it?’. Arguably, Mills’ statement could be dismissed as somewhat passé given the number of apparently traditional sporting events that have embraced sponsorship, such as golf’s Open Championship, which began in 1860 and is debatably as steeped in tradition and ritual as Wimbledon, yet sees players sporting outfits emblazoned with their sponsors’ logos and hoardings around the course promoting corporate partnerships. With this example in mind, however, we could argue that golf has lost some of its tradition and apparently exclusive allure, and the same thing could potentially happen to Wimbledon if it’s brand of tradition was broken. That is to say that key sponsors, partners, and brands that associate themselves with the event will lose interest due to the reduced exclusivity and perceived debasement of the event if less prestigious brands were allowed to advertise there. In an interview with the UK Tennis Industry Association in 2013, Sir Martin Sorrel, CEO of WPP Group (also known for being group finance director at Saatchi & Saatchi), claimed that ‘outside of the Olympic Games and the World Cup, Wimbledon is the most powerful sports property’, with a worldwide audience of more than one billion. While Wimbledon continues to tread slowly into the domain of sponsorship, its selections are carefully attuned to its brand. Stella Artois joined in 2014 as official supplier in a contract which ends in 2018 as a part of ‘The World’s Greatest Events’ campaign, while Pimm’s continues to be sold as one of the two staple drinks at the Wimbledon tennis tournament. With these restrictions in place, sponsors have had to find innovative ways of marketing, and social media has proved indispensable as a means of doing this. Andy Murray’s popular Twitter presence was partly helped by a rigorous social media campaign by his sponsor Adidas. Tech companies like Sony have capitalised on the high-definition revolution by using footage of Wimbledon players like Anne Keothavong to showcase tiny logos that can be seen only on their 4k screens. The use of modern advertising and marketing practices and channels has allowed Wimbledon to continue to thrive whilst not losing its traditional image. 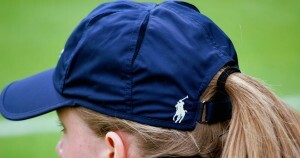 Viewers can connect with the tournament through marketing promotions produced not only by its official suppliers, but also by brands using the umbrella of the Wimbledon tennis tournament. I spent yesterday morning in a radio studio in Clerkenwell. This is not a normal way for me to spend a Thursday, but I was invited in to work on a fascinating project with Honda as part of their preparation for the Goodwood Festival of Speed, which starts next week. Honda had commissioned a poll of 2,043 adults from around the UK to find out about people’s favourite sporting moment, and the sportswomen and men who they see as ‘unbeatable’. There were a few qualifications – the sporting moments had to be British triumphs, while the heroines and heroes could be from anywhere. The poll led to the compilation of three Top 10 lists, and I was asked to front the publication of these lists through a series of radio interviews. I did 13 in all, including many BBC regional channels and a number of commercial stations. It felt a bit groundhog day after a while, as some of the interviewers inevitably asked similar questions, but it was a fascinating process, and it gave me the chance to reflect on the kind of qualities that people want in their sporting moments and icons. Topping the list of Greatest British Sport Triumphs of Our Time was, inevitably, the England men’s football team winning the World Cup with their 4-2 victory over West Germany in 1966. This felt a little like when people compile lists of best albums or best movies of all time, and Sgt Pepper and The Godfather come out on top. I love both, but it sometimes feels like they are the starting point and then people go on from there. With 1966, though, there is an added dimension – after all, both The Beatles and Francis Ford Coppola made other things after those triumphs. For me, the appeal of 1966 resides not just in a fantastic match with all the drama you could want, but also in the way that it stands alone as the only major silverware that the men’s team has ever won. I was also intrigued by how this triumph still resonates for people lime me – anyone under 50, in fact – who have no personal memory of it, and have come to it only at second hand or through Baddiel and Skinner’s ‘thirty years of hurt’. Beyond that, it was fascinating to see that the majority of the moments in the Top 10 were individual or pairs events rather than team events. England’s victory in the 2003 men’s Rugby Union World Cup came in at No. 8, and the epic Ian Botham Ashes series of 1981 was one place behind it, but the rest were not team events. Andy Murray’s 2013 Wimbledon win went straight in at No. 2, followed by Torvill and Dean’s Bolero routine at the 1984 Sarajevo Olympics, Roger Bannister’s sub-four minute mile from 1954, and then key triumphs for Steve Redgrave, Bradley Wiggins, and Mo Farah. Intriguingly, Francis Chichester’s 1966 solo circumnavigation of the world was at No. 10, an impressive feat that I for one had assumed many people had forgotten about. 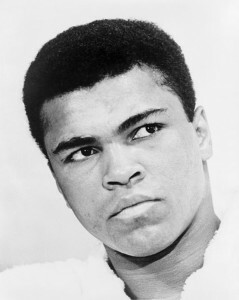 When it came to the heroines and heroes, lawn tennis legend Martina Navratilova and boxer Muhammad Ali topped the respective lists. The people who were polled clearly respected longevity and consistency in their sporting icons, as both of these athletes were at the top of their game for many years. 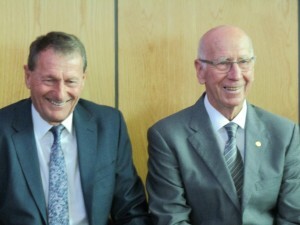 It was refreshing to see only two footballers in the men’s list – Pele at No. 3 and George best at No. 7 – and also good to see aesthetic sports being valued, with Top 10 finishes for skater Jayne Torvill, and Olympic gymnasts Olga Korbut and Nadia Comeneci. Athletics was represented by Usain Bolt, Mo Farah, Jessica Ennis, Roger Bannister, Paula Radcliffe, and Kelly Holmes, and many other household names, from Ayrton Senna to Steffi Graf, made good showings. Of course, this kind of list making is essentially a bit of fun. Everyone will have their own favourite that gets missed, and everyone will have some alternative to the Top 10. The responses are incredibly relative, so sports that are huge in some areas (such as rugby league) got averaged out of the national picture – looking at this list, you would not know that Great Britain have won the men’s rugby league world cup three times, in 1954, 1960, and 1972). I was surprised to see no golfers in there, or anyone form the world of horse-racing, and disappointed (but maybe not surprised) that the 2012 Paralympics had not made a big enough impression on popular memory to be recalled. It is also obvious, but probably no great shock, that victorious England women’s teams seem to have had their triumphs forgotten. England women won the rugby union World Cup in 1994, and the England team won the women’s cricket World Cup in 2009, but they don’t get a mention. Indeed, it is perhaps ironic that as I write, the mainstream media is full of incriminations and navel gazing over one England team losing 2-1 to Uruguay in one World Cup, while paying virtually no attention to the other England team beating Ukraine 2-1 on the same night in their bid for 2015 World Cup qualification. No prizes for guessing which of these teams was made up of men, and which of women. Overall, the lists showed an interesting mix of long and short-term moments, and icons from the past and the present. They suggest that the respondents value the Olympic Games, care about individual sports as much as team games, and hold such characteristics as longevity, dedication, character, and style in high esteem. Routledge have just brought out a new book in their series Routledge Research in Sports History. Edited by Pascal Delheye, it’s called Making Sport History: disciplines, identities and the historiography of sport. The collection brings together essays on different aspects of researching and teaching sports history, with authors from North America, Australasia, and Europe all contributing. My chapter, ‘History and Sport Studies: Some Methodological Reflections on Undergraduate Teaching’, is a personal reflection on the challenges and opportunities of teaching history on a Sport Studies degree course, where most of the students chose to give up History while still at school. The book is now available from Routledge. Click here for full details of In The Loop, and for the programme for the study days. 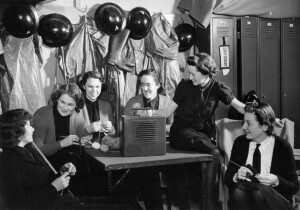 Click here for details of the Knitting Reference Library at Winchester School of Art. You can also follow In Loop on @intheloop3. 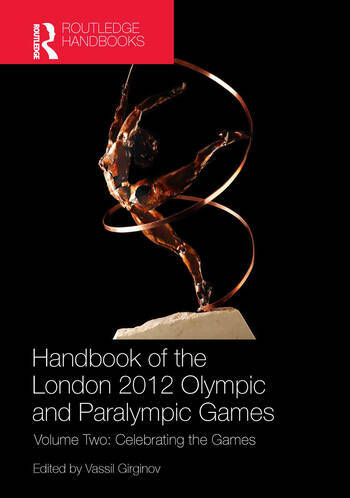 Volume 2 of the Routledge Handbook of the London 2012 Olympic and Paralympic Games is now out, edited by Vassil Girginov of Brunel University. It’s a fascinating project, with both volumes devoted to a diverse, wide-ranging, and critical discussion of the Games. Across the two volumes, themes include bidding, planning, legacy, celebrity, and protests, and the authors who have contributed include academics from a range of backgrounds. My chapter is called ‘Inspire a Publication: Books, Journals, and the 2012 Olympic and Paralympic Games’, and is part of the section on Documenting the Games. Big thanks go to Vassil for his vision and hard work in managing this huge project. I’m delighted to see Fiona Skillen‘s first book has come out – Women, Sport and Modernity in Interwar Britain. It’s part of the new series of sports history monographs that Peter Lang are publishing in the series Sport, History and Culture, where it joins Dave Day’s Professional, Amateurs and Performance. The series is mainly dedicated to bringing expanded versions of excellent PhD theses to the wider audiences that they deserve, and it’s great to see Fiona’s work in this setting.